On the 29th August 2000 the four times Argentine world champion in Marathon Swimming, Claudio Plit, swam the Beltquerung obtaining a new Beltrecord. In 7 hours 28 minutes he beated the time of María Inés Mato (ARG) by 3,5 hours. With best climatic conditions, the most successful long-distance swimmer since now catched despite the low water temperature of 15C°, the strong countercourrent as well as an indigestion, which was finally overcome. At the beach he was enthusiastically received by several hundred spectators. The Argentine Tango group ”Mal de Amores”, who was present on the occasion of the Argentine Week on Fehmarn acted in the eventprogram at the beach and at the welcome celebration. With his successes in Marathon Swimming, the 46 years old Argentine is considered the most successful Marathon swimmer of all times. His name is listed in the Hall of Fame. 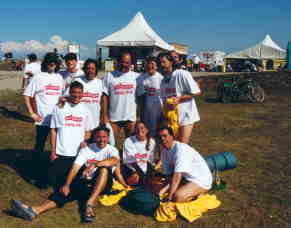 On 30 August 2000 an Argentine relay team with the well-known swimmer María Inés Mato swam for the first time through the Fehmarnbelt. In the time of 6 hours 20 minutes they set a good time for further relays. At 07:09 am María Inés Mato started in Denmark and after one hour she was replaced by Luís Marceca. Afterwards followed in the hour rhythm: Maíta Torresagasti, Francisco Layús and Ariel Navarro. María Inés Mato and Luís Marceca swam twice. 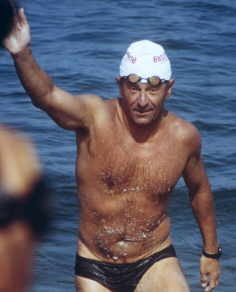 The relay covered the last meter s to the beach together with Claudio Plit, where the swimmers were received with a strong applause by hundreds of spectators. Afterwards in a general interview with the sportsmen, they told more about their experiences of covering the new discipline of the Beltquerung. The meaning of this relay is to give groups the possibility of experiencing a small Beltquerung. Swimmers wishing to cover the hole 20 km distance later can receive experiences of the distance in covering a shorter part in group.